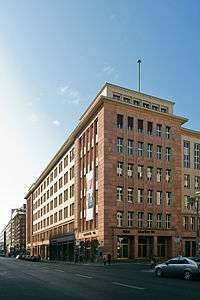 The Hertie School of Governance is a German private university with the right to confer doctorates in Berlin's Friedrichstraße. Half of the students in the Hertie School come from abroad, and the working language is English. Predominantly, Hertie's students have backgrounds in law, economics, political science and international relations. The school offers to its students the opportunity to complete a "professional year" at a multinational corporation, government ministry or an international organization. In addition to this possibility, research collaboration with faculty is encouraged. Hertie students who are also admitted at a partner university, such as the London School of Economics, Columbia University, Institut d’études politiques de Paris, University of Tokyo and Bocconi University can spend their second year in these institutions and earn an additional master's degree in International Relations or Public Policy. The Hertie School of Governance was founded by the Hertie Foundation, located in Frankfurt. The school was established in 2003 as one of the first European professional schools for public policy. In February 2005, the Hertie School was awarded state recognition as an institution of higher learning by the Berlin Ministry of Science, Research, and Culture (Senatsverwaltung für Wissenschaft, Forschung und Kultur). The work of the Hertie School is based on four pillars: Research, Degree Programmes (Master of Public Policy, Master of International Affairs, Executive Master of Public Administration, and the Berlin School for Transnational Studies), Executive Education, and Knowledge Transfer. In September 2015, 390 master students were enrolled at the school. Up to 20 of the new students may join a dual degree program, after being accepted by a partner university. The Hertie School of Governance has a highly selective application process. The Master of Public Policy (MPP) programme offers teaching on corporate relations & government affairs in the public, civil society and private sectors. The programme is intended for students pursuing a future career dealing professionally with problems of modern governance, international relations, advanced economics and politics. Upon completion of the two-year programme, students receive the Master of Public Policy (MPP). Prospective students have typically studied economics, law or political science, but candidates from every field of study apply for admission. The Master of International Affairs (MIA) programme, a new programme added in fall 2015, focuses on international relations. It prepares for positions requiring a profound understanding of today’s global policy challenges. The Executive Master of Public Administration (EMPA) programme is aimed at experienced professionals for whom cooperation between government, business and civil society is an important part of their work. Participants in the Executive MPA programme choose an individual area of concentration and can either study full-time over a period of one year or complete the programme over a period of two years if they wish to study part-time while working. Prospective students must have at least two years' professional work experience, as well as an educational background in economics, law or social sciences. There exist exchange programmes with the ESCP Europe, the Copenhagen Business School and the University of Bern. In September 2016, the Hertie School started a joint MPA/MBA degree programme in cooperation with the European School of Management and Technology, the first MPA/MBA dual degree programme in Europe. The Hertie School of Governance also offers a PhD study programme as part of the Berlin Graduate School for Transnational Studies (BTS), a joint endeavour of the Freie Universität Berlin (FUB), the Hertie School of Governance (HSoG) and the WZB Berlin Social Science Center. In autumn 2012, the Hertie School welcomed its first PhD cohort. PhD candidates take core curriculum courses in their first year while beginning their dissertation research and are expected to complete their PhDs within three years. Members of the core faculty are President Helmut K. Anheier, Kerstin Bernoth, Mark Dawson, Henrik Enderlein, Christian Flachsland, Mark Hallerberg, Gerhard Hammerschmid, Anke Hassel, Klaus Hurrelmann, Wolfgang Ischinger, Markus Jachtenfuchs, Christian Joerges, Mark Kayser, Claudia Kemfert, Genia Kostka, Michaela Kreyenfeld, Johanna Mair, Jan Christoph Minx, Alina Mungiu-Pippidi, Jean Pisani-Ferry, Andrea Römmele, Christian Traxler und Kai Wegrich. The Hertie School of Governance has established dual degree programs: with the MPA Programme at the London School of Economics and Political Science (LSE), the MPA Programme at SciencesPo in Paris, and the School of International and Public Affairs (SIPA) at Columbia University in New York City, the Programme in Government and International Organizations at Bocconi University in Milan and MPP Program at the University of Tokyo. Apart from the dual degree programmes, students also have the option to spend an exchange semester at the Georgetown Public Policy Institute (GPPI) at Georgetown University, the Lee Kuan Yew School of Public Policy at the National University of Singapore, the Terry Sanford Institute of Public Policy at Duke University, the Maxwell School of Citizenship and Public Affairs at Syracuse University, the School of Public Policy & Management at Tsinghua University, the Graduate School of Public Policy, University of Tokyo, Trachtenberg School of Public Policy and Public Administration at The George Washington University, American University School of Public Affairs at American University and the Graduate Institute of International and Development Studies in Geneva. The Hertie School of Governance also has partnerships in the Berlin education landscape: with the WZB Berlin Social Science Center, the Freie Universität Berlin (FU), the Humboldt-Universität zu Berlin (HU), the ESMT European School of Management and Technology, and the University of Potsdam. Furthermore, the Hertie School is a member of key political science and policy analysis associations. These include the European Consortium on Political Science Research (ECPR), the American Political Science Association (APSA), and the Association of Professional School of International Affairs (APSIA), PolicyNet, and the Global Public Policy Network (GPPN). Wikimedia Commons has media related to Hertie School of Governance.